It was March 18th, and I was hiking out of N.O.C in Wesser, NC. I met two guys coming the other way on a short day hike without backpacks. It turns out Harry and Leo were doing something similar to me - working their way south by day hikes. Their method was to use two vehicles parked at either end and hike each section just one way. They started in Damascus, VA and were headed to Springer. Our first moments, on meeting that first day were a little awkward, but the next day they helped me with logistical issues related to the closed road to Deep Gap and we got on well. We met several more times in coming days and had nice chats, and then our paths drifted apart. 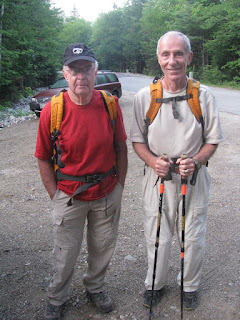 Today at 6:15AM I was parked at East B Hill Road, 8 miles up from Andover, Maine getting ready to head out on my hike when a familiar vehicle pulls up and two familiar guys get out and put on day packs. Yes, it was Harry (left) and Leo. I could hardly believe it. Turns out when they got to Springer they liked what they were doing so much that they decided to do the whole trail. Back then they had no intention of doing more than getting to Springer. So after a break they headed up to Katahdin and are now working their way south, again by day hikes using their two vehicles. What a surprise! They picked my brain a bit about Mahoosuc Notch and I took this photo. We were all in a hurry, so the meeting was brief. Storms were forecast for this afternoon and we wanted to accomplish our respective hikes early. Harry and Leo went north to South Arm Road. I headed south to Surplus Mountain and back then did about 3.5 miles of the trail north to the south shoulder of Wyman Mountain and back. When I got back, Leo's car was gone. It's unlikely that I'll see them again, and an amazing coincidence that we had the chance to meet at all. I had hoped to get an earlier start than I did today. I should have been out on the trail by the time they arrived at the parking lot. Such are the strange twists in the fiber of time and space. Oh - my other friend? - of a very different sort? Consistently easy trail! I mean real soil, gentle slopes, very few rocks or bedrock slabs, and no mountains above 2800 feet. It really did feel like a familiar old friend I hadn't seen in a long time. I could walk the way I used to - able to take in the scenery, grab a snack, or look at my map without coming to a full stop, able to move forward with momentum rather than being ready to stop on a dime for a spot of tricky footing. It felt good, but I know it won't last. The weather held off. 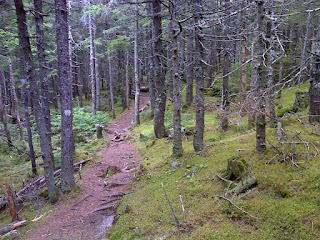 In fact it didn't rain until after 6PM, but because of the easy trail I was finished by 3PM. That's not a bad thing, though ... getting a little more rest time. 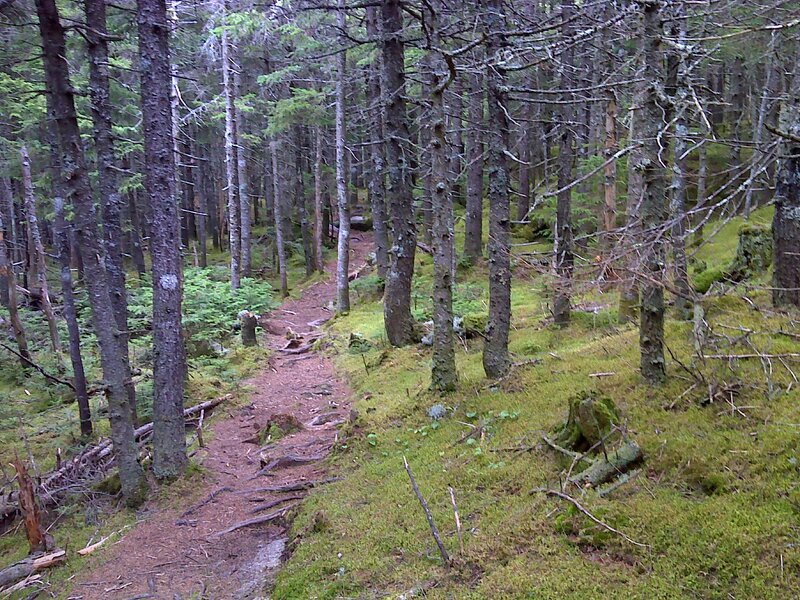 Tomorrow's trail features two fords (four for me) and some very strenuous climbing up both walls of Sawyer Notch. The old friends will be elsewhere.